According to the latest market study by Juniper Research, recent findings reveal that vendors of Tablet Hybrid devices will ship nearly 50 million units by 2018, rising from an estimated 9.5 million in 2013. Tablet hybrids, also known as 2-in-1 devices, are designed to achieve additional or improved tablet functionality through the use of accessories, or can be in the form of an Ultrabook that can have the screen removed to perform as a slate. As hybrid devices are relatively young, there is a distinct lack of industry standardization for what it actually constitutes -- when a media tablet or notebook PC becomes a hybrid. Also, due to the lack of demand for these devices, the shipment figures released by vendors do not granulate to the required level. As mentioned recently on Digital Lifescapes, Microsoft and Intel are likely to invest a significant amount of their 2014 marketing budget to motivate their channel partners to introduce and promote these high-cost devices in the marketplace. Juniper observed that the tablet market is becoming increasingly diverse as new form factors emerge. 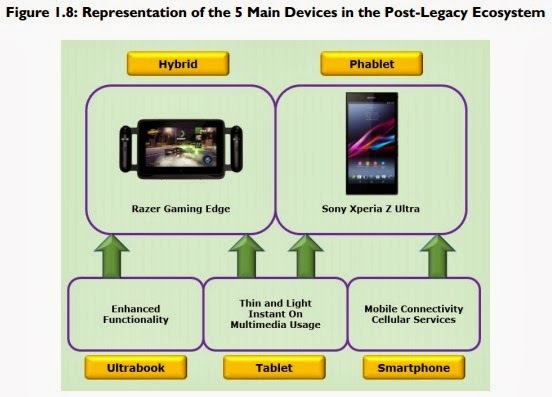 This small scale evolution in the grey area between the tablet and ultrabook PC market is appealing to a niche demographic, mostly business users and gamers with large disposable incomes. These demographics are also the most able and willing to spend on expensive new devices. The latest Galaxy Tab-Pro is an example of such a proposition -- a business-friendly tablet together with a dedicated keyboard and mouse. Meanwhile, in the mainstream tablet market, the significant drop in the price of tablets has meant that several governments and schools are now providing students with either free or subsidized media tablets. Schemes include the government of Thailand’s "One Tablet PC per Child" policy or the Aakash tablets subsidized by the Indian government. Consequently, the media tablet is now seen also as an educational tool in certain markets. It is also perhaps indicative that the future of education is more towards research and interactive programs. Hybrid average selling price (ASP) will remain stable over the forecast period due to the more affluent buyer demographics. Retailers are increasingly launching low-cost media tablets as a gateway to their online services via widgets and pre-installed features. It's unclear which of the other vendor channel partners will participate in promoting these high-cost devices in the post-legacy value chain.